As a reminder, hundreds of cities across America have guaranteed access to public restrooms based on gender identity for years without any problems. By permanently preventing such a solution in any North Carolina cities, the main thing HB 186 would do is to keep our state mired in the same absurd and embarrassing position it’s been for the past 11 months. #2 – It offers no protection from discrimination to LGBTQ North Carolinians – The new proposal does absolutely nothing to prevent discrimination against LGBTQ North Carolinians under state law. The only smidgen of a grudging concession contained in the proposal is a section that would allow cities to adopt general nondiscrimination ordinances (that must, of course, have nothing to do with bathrooms). But then the sponsors add a whole new and unprecedented procedure on top of that to allow opponents of such plans to demand local referenda anytime cities try to do the right thing. Great, just what our state needs: dozens of local political campaigns to test whether LGBTQ people should have basic human rights. Can you imagine if we were required to hold public votes on proposals to ban discrimination based on race? It’s a wonder the sponsors didn’t include an appropriation to the haters in Franklin Graham’s operation or the misnamed North Carolina Values Coalition to organize those local challenges. The bottom line: The new proposal does absolutely nothing meaningful to move North Carolina into the 21st Century on this issue. 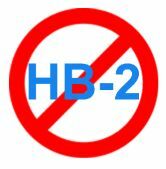 The sponsors may have been working on it for a long time and sincerely believe that it is a genuine “compromise,” but there’s a much simpler and better solution that has yet to be tried: let the members of the General Assembly have a simple “up or down” vote on a straight repeal of HB2. Let’s see how lawmakers vote when they are given such an opportunity and then we can determine whether there’s a need for some kind of “compromise.” That Senate President Pro Tem Phil Berger and House Speaker Tim Moore will not allow such a vote speaks volumes about what they fear will happen if HB2 is really put to a public test.